A poignant story of love and sacrifice. Story blurb: It is September 1919: twenty-one-year-old Tristan Sadler takes a train from London to Norwich to deliver a package of letters to the sister of Will Bancroft, the man he fought alongside during the Great War. But the letters are not the real reason for Tristan’s visit. He can no longer keep a secret and has finally found the courage to unburden himself of it. As Tristan recounts the horrific details of what to him became a senseless war, he also speaks of his friendship with Will–from their first meeting on the training grounds at Aldershot to their farewell in the trenches of northern France. The intensity of their bond brought Tristan happiness and self-discovery as well as confusion and unbearable pain. 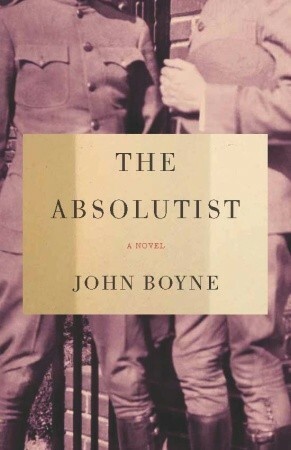 The Absolutist is a masterful tale of passion, jealousy, heroism, and betrayal set in one of the most gruesome trenches of France during World War I. This novel will keep readers on the edge of their seats until its most extraordinary and unexpected conclusion, and will stay with them long after they’ve turned the last page. About the author: John Boyne (born 30 April 1971 in Dublin) is an Irish novelist. He was educated at Trinity College, Dublin, and studied Creative Writing at the University of East Anglia, where he was awarded the Curtis Brown prize. But it was during his time at Trinity that he began to get published. To pay his way at that stage of his career, he worked at Waterstone’s, typing up his drafts by night. John Boyne is the author of six novels, as well as a number of short stories which have been published in various anthologies and broadcast on radio and television. His novels are published in 39 languages. The Boy in the Striped Pyjamas, which to date has sold more than 4 million copies worldwide, is a #1 New York Times Bestseller and a film adaptation was released in September 2008. It was only after I read The Absolutist by John Boyne [Other Press, July 10, 2012] that I came to realize how many reviews had been written about this book—by some pretty heavy-hitters, as well. It made me pause to wonder if there was anything new to say about it, or, indeed, if there was anyone in the world who hadn’t read it. Nevertheless, I decided that my own opinion is all I can ever offer, anyway, and like me, there might be a few out there who have taken a while to find it. The story is written around Tristan Sadler at various stages of his life, from his expulsion from home, to his enlisting in the army in 1919, and then afterward until he is a reclusive old man. Interspersed among these is his relationship with a boy named Will Bancroft, his war years, and his withdrawal from society to live with his memories. In spite of the complexities of this story the author kept a fairly steady hand on the reins. Tristan, as the protagonist, is a likeable kid who is somewhat adrift on the fickle currents of life, and as such he is frequently knocked about. His drill sergeant is a sadist, His friend (lover) Will is a cad, and Will’s family are an insensitive lot. Nonetheless, he endures all of this with a kind of innocence that is allotted to fools and children. As I alluded above, all of this is well written, and for the most part quite credible. We can feel for Tristan’s disappointment that Will won’t commit himself (even though we’d like to slap him); the mud, discomfort and hell of WWI trenches are vividly portrayed; and the poignant moments of Will’s death are all quite real. However, the shortcoming (in my mind) is that it follows in the wake of so many other GBLT novels, inasmuch as it is well-written but dark. Is there no joy in ‘gayville’’? There were a few anomalies, too. For example, Tristan seemed remarkably literate from his stated background, and I found the ending—particularly with the gratuitous visit Will’s sister—somewhat unusual. Altogether, however, it is a story that will hold your interest. Three and one-half bees. It is a collection of little-known people, facts and events in Canadian history, and includes a bibliography of interesting books as well. Latest post: (Sir) Ernest Thompson Seton, Author, artist and naturalist extraordinaire. 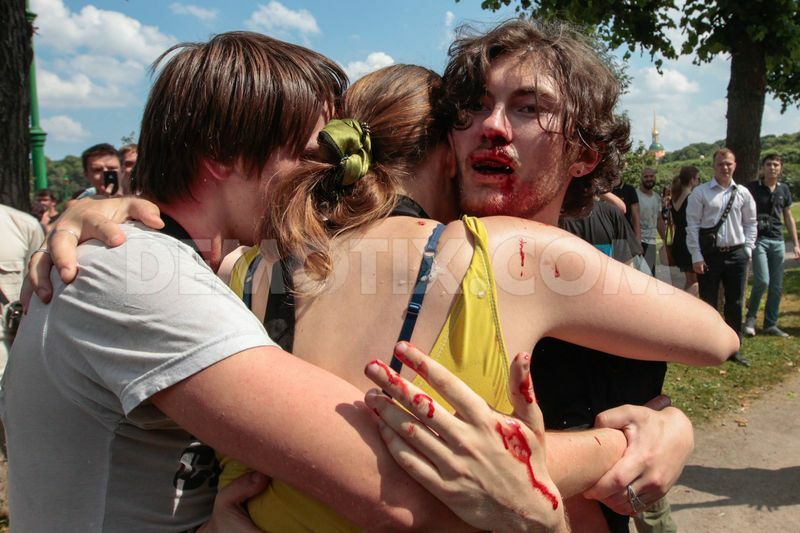 This is the face of state-sanctioned persecution of gays and lesbians in Russia, To date vicious beatings, arrests and even murder have been spawned under Vladimir Putin’s so-called ban on “homosexual propaganda.” It is a cruel, political ploy to prop up his sagging popularity. He is playing St. George, and homosexuals are his made-up dragon. At the bottom of it, however, is a unwarranted attack on human right for which Putin has no regard. Protest the staging of the Olympic Games in Russia. There is an alternative in Vancouver that won’t penalize the athletes. Do it for the GBLT community, do it for human rights, and do it for humanity.